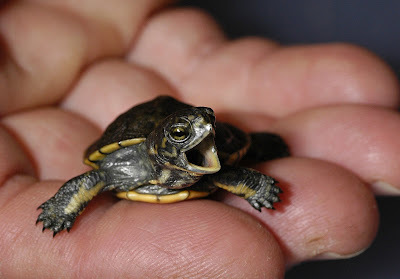 Here’s your chance to help us save endangered turtles—all you have to do is cast a vote! Woodland Park Zoo has been selected as one of three local conservation organizations to participate in the 2009 Patagonia Voice Your Choice Program. From September 24 through October 24, customers at the downtown Seattle store will learn more about each of the three selected organizations. Customers can then vote for their favorite organization. Grants will be awarded based on the voting—First place: $2,500, Second place: $1,500, and Third place: $1,000. Proceeds from this program will go to Woodland Park Zoo's Western Pond Turtle Recovery Project, a collaborative, grass-roots effort to restore Western pond turtle populations in Washington state. 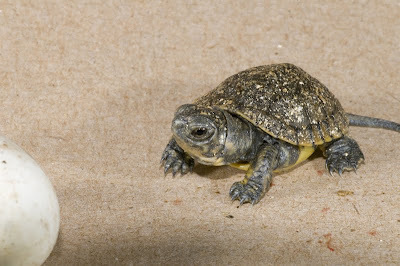 Funds will help cover the costs of Woodland Park Zoo's headstarting program, in which baby turtles are reared in captivity, then released into the wild when they are large enough to be safe from predators. Western pond turtles were on the verge of extinction in Washington in 1990, with only a mere 150 turtles left in the wild. Thanks to the Western Pond Turtle Recovery Project, we’ve helped boost the population of the species to about 1,500 in Washington state. Now we’re asking for your help to grow this successful conservation effort even more and keep hope alive for this endangered species. Come visit us at our in-store zoo booth at Patagonia, October 3 from 2:00 – 6:00 p.m. and October 4 from 11:00 a.m. – 3:00 p.m.
Busy that weekend? No problem—you can come to the store to cast your vote any day between September 24 and October 24. You can even return the next day and vote again; only one vote per day please. 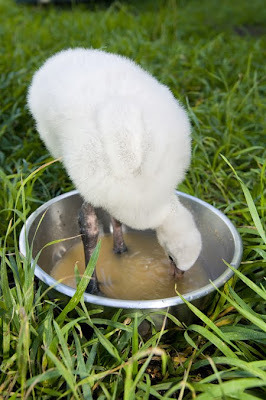 Now 2 weeks old, the chick has been introduced to water, as well as to solid foods in the form of a slurry which it has already learned to filter feed from. The chick is currently off public view. Woodland Park Zoo's conservationists and staff photographer traveled to Papua New Guinea in April this year to help celebrate the passage of PNG’s first national Conservation Area—a conservation milestone 12 years in the making with Woodland Park Zoo’s Tree Kangaroo Conservation Program, partners, and PNG villagers and government. This video transports you to the Sing Sing celebration in the highland village of Teptep, Papua New Guinea, complete with songs and dances honoring this national achievement and the international unity behind it. Hear from the many Papua New Guinea nationals who have contributed their own land, time and dedication to this project. This is one huge step we are proud to be part of. Go here to learn more about the 187,000 acre YUS Conservation Area and how you can help support it into the future through Woodland Park Zoo’s Tree Kangaroo Conservation Program. You can also help by spreading the word of this conservation breakthrough--please share this blog post and video with your friends. We’ve got exciting news! 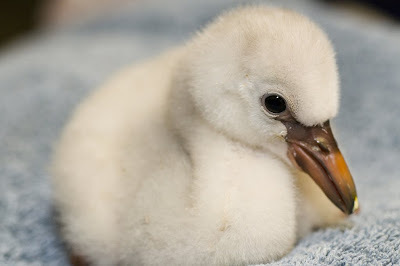 A Chilean flamingo chick has hatched at Woodland Park Zoo, marking the first time the zoo has successfully hatched a Chilean flamingo in its 109-year history! The chick hatched in an incubator on August 25, following a 29-day incubation period. 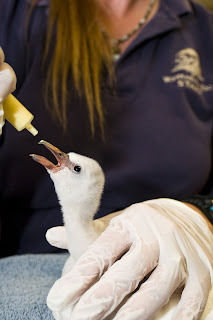 To ensure a higher chance of survival, a team of dedicated and expert staff are hand-raising and hand-feeding the chick off public exhibit for now. You might remember the arrival of a new flock of more than 25 flamingos last year. They debuted in a brand new 4,000-square-foot exhibit that opened in May 2008. This spring represented the first full breeding season for the new flock in the new exhibit as the graceful birds put on a striking show of synchronized courtship and ritualized behaviors for zoo guests – head flagging, wing saluting and marching in sequence and unison. This active display culminated with nest building, egg laying and one chick to date! Zoo guests can see the adult flamingos and nests in their exhibit near the Temperate Forest. An additional three eggs are currently being artificially incubated and are expected to hatch within the next few days. Are you wondering why the chick isn’t pink? 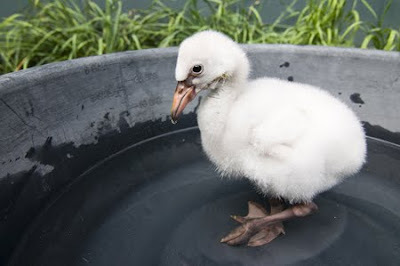 Flamingo chicks hatch with a whitish, gray down and don’t acquire pink feathering (at first mixed with gray-brown contour feathers) until about 1 year old. They are fully pink by 2 to 3 years of age.